A research team with scientists from India and the U.S. have discovered a new frog species in the Western Ghats. Astrobatrachus kurichiyana, the new frog was discovered during an expedition to an isolated hill range, the Kurchiyarmala peak. Additional research is necessary, report the scientists, to establish more information about the species and determine if conservation measures are required. One more new frog species has been spotted in the Western Ghats of India, reconfirming the region’s status as home to one of the richest assemblage of frogs in the world. The scientists have named the frog Astrobatrachus kurichiyana. Astrobatrachus is in recognition of its starry spots and kurichiyana in honour of the ‘Kurichiya’ indigenous community of Wayanad in Kerala, where the scientists stumbled upon this new species, a release from Indian Institute of Science, whose scientists were part of the team, says. As of now, this species is known only from the Kurchiyarmala peak, an isolated hill range located on the western edge of Wayanad plateau in the south-central region of the Western Ghats’ steep slope. Details of the new frog, a secretive being that remains below leaf litters under the thick tree canopy of the shola forests in the region, are published by an international team from India and U.S. in the latest issue of PeerJ. The Western Ghats, one of India’s richest biodiversity hotspots, with at least three endemic frog families, have been throwing up several new frog species and even new genera, in the last decade. But it is rare that scientists additionally report an entire new sub-family of frogs, as has happened with this new frog. Molecular analysis by the scientists suggests that the most recent common ancestor of this new species would have diversified around 60 to 70 million years ago. 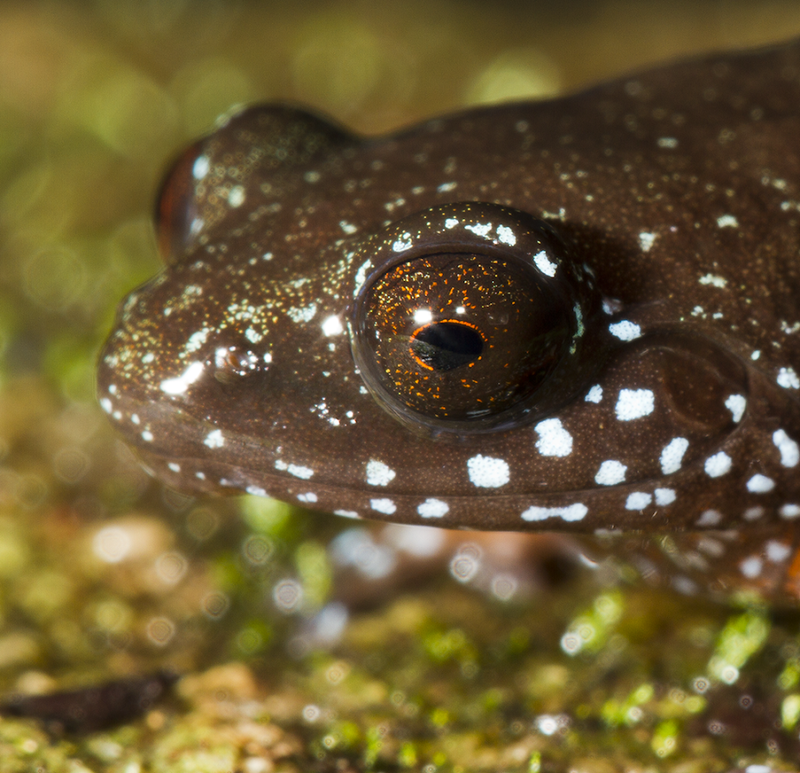 A. kurichiyana’s constellation-like speckles are tinged with blue, an uncommon colour on frogs in the Western Ghats. Photo courtesy of S.P. Vijayakumar. “The Western Ghats hosts a rich diversity of frog species, many of which have been discovered in the past 20 years. This particular new species is exciting because it represents a very distinct, and likely very old, lineage that we did not know existed,” David Blackburn, Associate Curator of Amphibians and Reptiles, at the Florida Museum of Natural History, University of Florida, and one of the authors of the paper, told Mongabay-India. 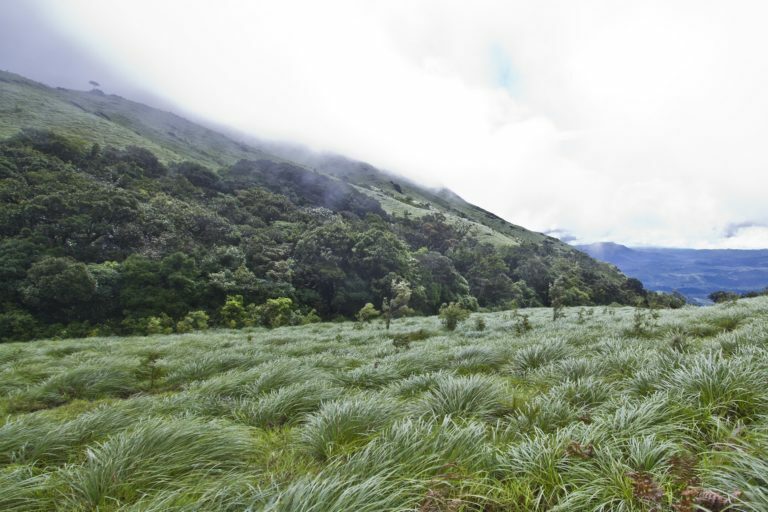 The scientists have assigned the new species to a new sub-family — Astrobatrachinae, whose closest relatives are Nycibatrachinae in the Western Ghats and Lankanectinae in Sri Lanka. While the frog is from peninsular India, its physical characteristics, especially the triangular finger and toe tips, most closely resemble frogs from South America and Africa. The isolated hill ranges of the Western Ghats act much like islands, preserving lineages of frogs that are found nowhere else. Photo courtesy of S.P. Vijayakumar. Its presence and other ancient lineages from the southern Western Ghats highlight its (Western Ghat’s) role as a historical refugium and as an important centre of diversification, the scientists’ report. They say that there remains much to be learned, not only about this frog, but also others that might be hiding in these biodiversity-rich forests. The new research builds upon previous work by researchers from the Centre for Ecological Sciences, Indian Institute of Sciences (IISc), Bengaluru, who in 2010 chanced upon an unidentifiable ‘strange’ frog during a large-scale night survey of reptiles and amphibians across all the major massifs and plateaus in the Western Ghats. The frogs were captured in June 2010 during nocturnal searches on the forest ﬂoor and in grasslands adjoining forest. Unable to place the ‘strange’ frog and similar unidentifiable specimens in known groups, the IISc team led by Kartik Shanker, associate professor at IISc set them aside to study on a later day. Team member K. P. Dinesh revisited the site in September 2017 to conduct intensive night sampling to understand the general habits and habitat of the species. 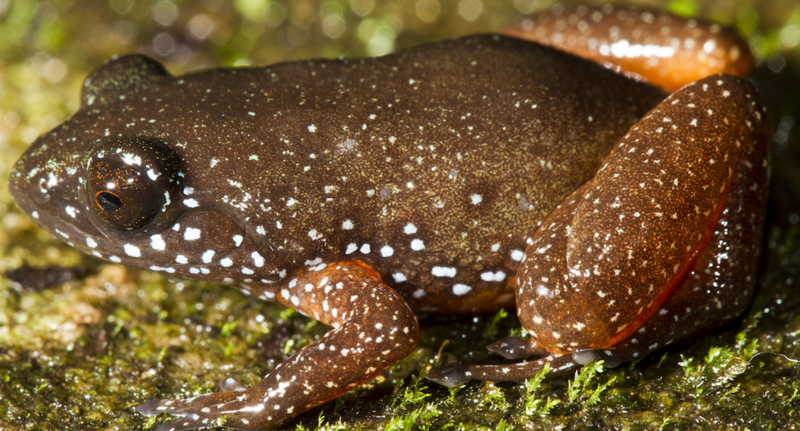 This time the scientists teamed up with U.S. scientists for identification of the ‘strange’ frog, studying in detail its physical characteristics, confusing colour patterns, starry spots on its side and bone structure. Astrobatrachus kurichiyana, also known as the starry dwarf frog, has only been found on a single hill range in India’s Western Ghats. The frog is about the size of a thumbnail. Photo courtesy of K.P. Dinesh. Ancient lineages hold signiﬁcant information for understanding the biogeographic past of different regions, the report says. A large concentration of old lineages may signify historical refugia that are of great evolutionary and conservation signiﬁcance. 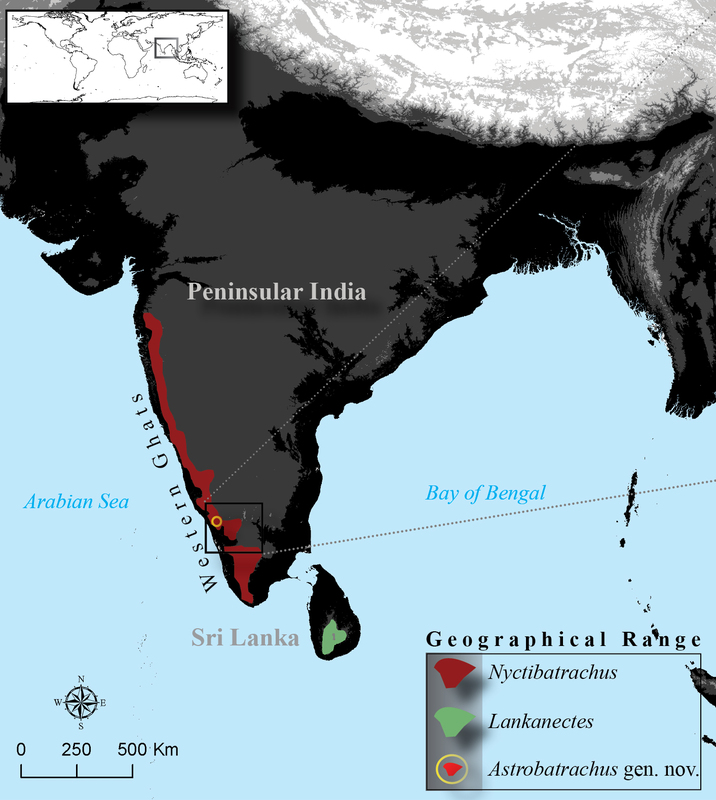 In South Asia, the Western Ghats escarpment in the Indian peninsula and the island of Sri Lanka have long been recognised as rainforest refuges. “These regions are an evolutionary repository for amphibians with hundreds of frog species from nine families,” the report says. Three of these frog families are endemic to the Western Ghats, while a fourth, Nyctibatrachidae, comprises two subfamilies: Nyctibatrachinae which is endemic to the Western Ghats, and Lankanectinae which is endemic to the island of Sri Lanka. The latest frog from Western Ghats adds to the series of discoveries of new frogs from the area, including some reported by Delhi University zoologist Sathyabhama Das Biju. Biju’s findings include an eel-like elusive tadpole, Micrixalus herrei from the sand beds of a forested stream in southern Western Ghats, which was reported in 2016 in PLoS One. Tadpoles of this “dancing frog’ family had remained obscure for 125 years, the PLoS One report said. This map shows the known ranges of Astrobatrachus and its two closest relatives, frogs in the genera Nyctibatrachus and Lankanectes. Map by Vijayakumar et al. in PeerJ. And in 2017, Biju’s team reported in PeerJ that they found seven new frog species belonging to the genus Nyctibatrachus, commonly known as ‘night frogs’, in the Western Ghats. Four out of seven of the new species of frogs are miniature-sized, 12.2-15.4 mm in size, which can comfortably sit on a coin or a thumbnail. These are among the smallest known frogs in the world. And the Western Ghats are not the only regions to house rare, and often unknown, frogs and tadpoles. Biju’s team reported in 2016 in PLoS One again the discovery of several populations of tree hole breeding frogs, from north-east India, which they identified as a “previously overlooked, yet distinct evolutionary lineage of frogs that warrants recognition as a new genus” and which they named Frankixalus. This distinctive frog group has gel-encapsulated eggs, breeds in water accumulated in tree holes, and lays its eggs on walls of tree holes. The tadpoles of feed on the mother’s eggs. Banner image: The starry dwarf frog’s colour and patterning are effective camouflage in glistening leaf litter. Photo courtesy of K.P. Dinesh.